Breast Cancer Awareness Month is in October. 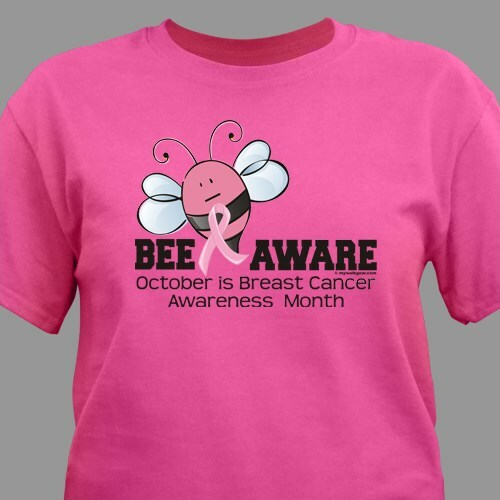 Make the world aware with this Bee Aware Breast Cancer T-Shirt. This Breast Cancer Shirt is great for showing you care for those suffering with this disease. Whether you are wearing this awareness shirt for Grandma, Mom, Aunt, Sister, Friend or to just show your support in finding a cure, this is a great way to spread the word about this important cause. Our Bee Aware Breast Cancer Awareness T Shirts is a great way to support the fight against Breast Cancer. Our Custom Printed Breast Cancer Awareness shirt is available on our 100% cotton preshrunk hot pink t-shirt, machine washable in adult sizes S-3XL. Would love to personalize it with my name...color is FANTASTIC! planning on getting additional on.